We have seen a price war for 4 year mortgage interest rates for the past couple of weeks. BMO was one of the first out of the gate to offer 2.99% for a 4 year mortgage, the other banks and lenders followed shortly thereafter. Now you can see 5 and 10 year mortgage interest rates at absurdly low levels. I've seen 5 year fixed rate mortgages at 3.5% which is unbelievably low. Fixed rate mortgages are very attractive right now. My preference for many years has been to go variable, but if you are not a gambler, then it could be getting close to the time where you lock in your mortgage. Read the article below that just appeared in the POST, it's very interesting what the experts are saying. The logic is pretty simple. You hit rock bottom and there is no where else to go but up. Mortgage rates on terms of five years and 10 years have never been this low. You can go back 50 years and not find a rate of 2.99% from one of the major banks for a fixed-rate product for five years. The 10-year, an almost unheard of length for most Canadians to commit to, has touched down at below 4%. Even sticking it out with a variable-rate product linked to the prime lending rate still looks pretty good with most major financial institutions offering some type of discount off their 3% floating rate. Already there are signs rates could be on the increase. The bond market - which mortgage rates are based on - has been rising fast and the big banks say their most recent specials will come to an end this week. But even with a 50 basis point increase, a five-year fixed closed mortgage of 3.5% is almost unheard of historically. "Everybody is looking at the bottom here and thinking, 'When are rates going to go up?'" .Even among the experts, few foresaw this price war in the mortgage sector. "With the big banks getting very aggressive again, it took a lot of people by surprise," said Mr. Mangaroo. "I think people were thinking the status quo would hold for a while." .He says the last Bank of Canada announcement about the economy had people thinking at some point the overnight lending rate, which impacts the prime lending rate, would go up, but not this year. "Now that people are thinking of early 2013, that has people talking but really that is just so far out says Mr. Mangaroo. "It's really just an abstract concept at this point." Craig Alexander, chief economist with Toronto-Dominion Bank, says he can understand how there might be some fatigue from consumers hearing about rising rates. "Unfortunately, we have been saying for years 'that's it, rates can't go any lower than they are today' and then they are [lower] 12 months later," Mr. Alexander says. .But this time out, he says, it almost seems impossible that rates on a five-year closed mortgage could go lower than the current 3%. "Short of the Canadian economy going into a recession and causing the Bank of Canada to cut rates back to their all-time low, there really isn't an environment that would lead to significantly lower mortgage rates," Mr. Alexander says. "The downside here is extraordinarily limited." The real risk for the consumer might be not locking in right now. While no one is expecting the overnight rate to go up anytime soon - discounts off the prime lending rate might even improve if the economic uncertainty calms in some parts of the world - the 50-year-low rates today could become hard to find. "If the economic forecasters are wrong about the outlook for growth and things turn out better than anticipated, then bond yield will rise, we'll have a steeper yield curve and higher fixed mortgage rates," Mr. Alexander says. "You won't be able to get what is offered today in 12 months time. They could go up half a percentage point or higher." In the interim, Gregory Klump, chief economist with Canadian Real Estate Association, says in terms of profitability, there is room for the banks to go lower on rates, but margins for the banks are so thin he doesn't expect it happen. "We are not out of the woods yet in terms of a clear picture that growth is going to strengthen," says Mr. Klump about the catalyst that could drive up bond rates, which would impact mortgage rates. "My own view is growth may well weaken." He predicts that any rise in rates will happen slowly, which the housing market would more easily absorb. "I do not expect it," Mr. Klump says about the type of interest rate shock that could send housing sales tumbling. Author Garth Turner, a noted pessimist on the fortunes of housing these days, thinks those who want to be in the market for a house should probably be grabbing on to long-term products. He says the banks know the housing market is already shrinking and are scrambling for a larger share of the mortgage market, something that also allows them to cross-sell other products like RRSPs to consumers. "The writing is already on the wall, prices will be declining," Mr. Turner says. "The Bank of Canada will be raising rates." A Bank of Canada hike will make variable rates rise fast, and he agrees the present day rates could look very good in a few years. "If you want to be a homeowner, it is an appealing product. Three or fours years from now, these rates could look absurd. I have no problem with being in real estate as long as it's not the bulk of your net worth. If you are getting into real estate now though and leveraging up, you are going to be unhappy about it," says Mr. Turner, adding the raising rate environment will hurt sales and prices will follow quickly. Don Lawby, chief executive of Century 21, says the rate wars going on right now combined with the unusually warm winter have already boosted housing sales, which could leave little demand left for the spring market. "Interest rates are low and they probably can't go any lower than they are," says Mr. Lawby, who thinks there is not much room for housing prices to go higher. "I looked around and say if the local economy stays good, the market can stay good. But these low rates are very key." 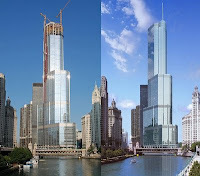 Donald Trump unveils new Trump Towers in Toronto Ontario Miss California would be proud! on their website, they state "You have just arrived at an incredible new standard of luxurious living. You are met by an exquisitely designed stone, steel and glass façade that rises 60-stories above an impressively redefined Toronto skyline. The lobby doors open and the attentive and friendly five-star staff welcome you inside. A grand piano’s gentle melody transforms your state of mind." The $500-million Trump tower is the first of three luxury hotel-condominium projects opening this year in Toronto, after The Ritz-Carlton opened last year. The Four Seasons Hotel and Private Residences and the 66-storey Shangri-La Toronto are also set to open this year. Toronto’s rise of luxury hotel residences follows a record year for tourism, with more than 9 million hotel-room nights sold in 2011, according to Tourism Toronto. The industry association said the availability of luxury hotel options attracts “high-value visitors” to the city. Trump International Hotel & Tower Toronto, Canada’s tallest residential building, opens Tuesday, capping a seven-year effort to bring the brand of billionaire Donald Trump to the country’s largest city. Trump International Hotel & Tower® invites you to create your own unique oasis within the heart of this magnificent city. From its coveted vantage at the intersection of Bay and Adelaide, residents and guests will enjoy first class access to all Toronto has to offer. Situated on the northwestern shore of Lake Ontario, Toronto boasts lush parks and historical neighborhoods. The financial hub of Canada, major banks, financial institutions and insurance companies all call Toronto home. A true international, multi-cultural city, Toronto has earned global recognition as a leader in not just the financial world, but also the performing arts, museums, art galleries, international cuisine and a thriving nightlife scene. Culture cravers love it. International travelers feel welcome. The discerning identify with its sophistication. Business executives appreciate its efficiency. The tower’s distinctive design and unique spire of light soaring 277 metres up the side of the building into the sky where it inscribes a signature on the city’s skyline was another deal maker. Security and privacy are paramount. Owners and their guests access via a separate entrance and are whisked to an exclusive residents-only lobby on the 32nd floor staffed by a full-time concierge. 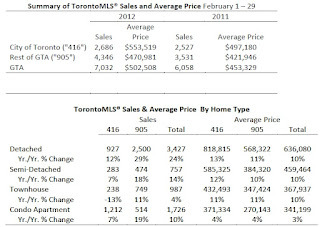 Greater Toronto REALTORS(r) reported 7,032 sales in February 2012 - up 16 per cent compared to February 2011. New listings were also up over the same period, but by a lesser 11 per cent to 12,684. It is important to note that 2012 is a leap year, with one more day in February. Over the first 28 days of February, sales and new listings were up by ten per cent and six per cent respectively. "With slightly more than two months of inventory in the Toronto Real Estate Board (TREB) market area, on average, it is not surprising that competition between buyers has exerted very strong upward pressure on the average selling price. important to note that both buyers and sellers are aware of current market conditions. This is evidenced by the fact that homes sold, on average, for 99 per cent of the asking price in February," continued Silver. 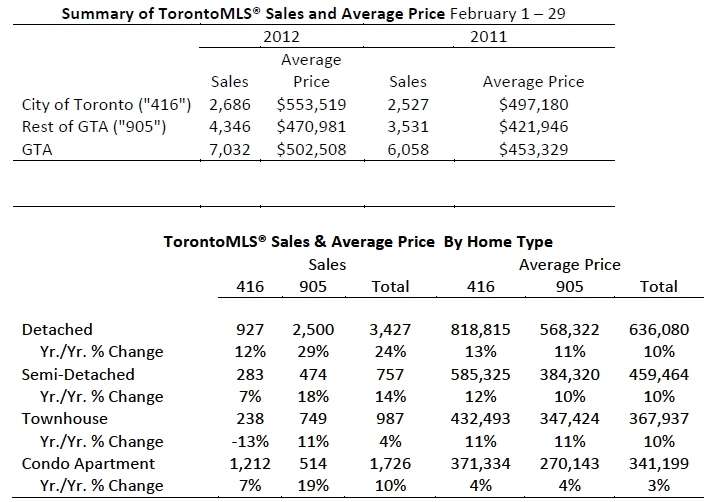 The average selling price in the TREB market area was $502,508 in February - up 11 per cent compared to February 2011. The Composite MLS(r) Home Price Index for TREB, which provides a less volatile measure of price growth compared to the average price, was up by 7.3 per cent compared February 2011. "If tight market conditions continue to result in higher than expected price growth as we move into the spring, expectations for 2012 as a whole will have to be revised upwards," said Jason Mercer, TREB's Senior Manager of Market Analysis. "While price growth remains strong, the average selling price remains affordable from a mortgage lending perspective for a household earning the average income in the GTA."